The Beagle USB 12 Protocol Analyzer is a non-intrusive Full/Low Speed USB protocol analyzer that includes real-time USB descriptor parsing. Developers can monitor what is happening on the USB bus as it happens with 21 ns resolution. Thanks to the Beagle USB 12 analyzer's low cost, every engineer can have his or her own. That means you do not have to schedule time to share your analyzer with other developers. Bottom line, your company saves time, effort and money. Interested in a high-speed USB analyzer with full class-level decoding? The Beagle USB 480 Protocol Analyzer can capture up to high-speed USB, low-level bus events and decode class-level data in true real-time. Detailed technical information about the Beagle USB 12 Protocol Analyzer can be found in the User Manual. The Beagle USB 12 analyzer is galvanically isolated so it will not affect the system under test nor distort the results. Simply attach the Beagle USB 12 inline to passively monitor Full-speed and Low-speed USB devices. It is also possible to monitor High-speed devices by attaching the device through a Full-speed hub. The class-level decoding feature of the Data Center Software provides real-time USB descriptor decoding for data captured with a Beagle USB 12 Protocol Analyzer. Full class-level decoding is available with the Beagle USB 480 Protocol Analyzer. Captured data is streamed via High-speed USB directly to your computer. The amount of data captured is limited only by the amount of physical memory available on the machine. See how your device interacts with the USB host in real time. Do not waste your time setting up complex triggers to capture data only to discover that the data of interest did not get captured. With the Beagle USB 12 Protocol Analyzer, you can see the USB packets in real time. Other analyzers claim to have real-time capture, but the Beagle analyzer is the only low-cost analyzer that lets you see USB packets as they are sent over the USB bus. The Beagle USB 12 analyzer is a bus-powered, High-speed USB 2.0 device. This provides two major benefits. As a high speed device, all the data capture by the Beagle USB 12 analyzer is transferred to the test computer at 480 Mbps. As a low power device, the Beagle USB 12 analyzer does not require a power adapter. This makes the Beagle USB 12 analyzer the ideal tool for engineers in the field. Just plug it into a High-speed USB 2.0 port on your laptop and you are ready to go. 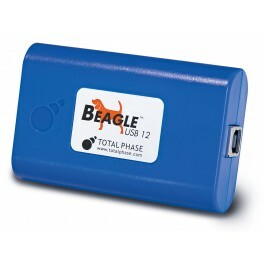 The Beagle USB 12 Protocol Analyzer comes complete with software. Additional discounts are available for larger volumes. By saving just a few hours of engineering time, the Beagle USB 12 analyzer will have paid for itself. Which Beagle USB Protocol Analyzer is Best to Monitor Full-Speed USB Traffic Between Embedded Devices?